The Water Remaining matter precipitated a ginormous upheaval in the nascent nuclear power industry in the USA in the early 1970s. More nearly accurately, the paucity of remaining water did that. I cannot begin to chronicle all that preceded and post-ceded the Water Remaining matter. Maybe others will jump in and fill in the blanks. One outcome was that funding was obtained to continue development of the RELAP5 code that is based on the RELAP codes and the two-fluid modeling work initiated by Chuck Solbrig and Larry Ybarrondo. In general, water reactor safety research, for which Camp NRTS was the principle player, received renewed, focused attention. It was boom times in Water Reactor Safety, right here in River City. The Water Remaining matter led to the infamous ECCS Hearings, the Interim Acceptance Criteria (IAC) for calculating the response of nuclear power plants to LOCAs as codified in the equally infamous Appendix K, dozens of trips of Camp NRTS personnel to Washington DC to be grilled by adversaries, 20,000+ pages of Hearing documentation, uncountable numbers of meetings and memos and reports at Camp NRTS, eventually a massive re-direction of the LOFT experiment, design, development and extensive analyses of additional experimental programs, uncountable numbers of critical reviews of the direction of the AEC program on reactor safety, &etc., &etc, ad infinitum. And who knows what else. But you can know with certainty that meetings and reports and paper were involved. Very likely there are dozens of interesting back-channel aspects of the drama known by Camp NRTS personnel. Maybe some will comment here. I’ll note that even after all this stuff had been accomplished, reviews and reports on the ECCS [edh, Emergency Core Cooling System] hearings, the background that led to the hearings, the technical soundness of the experimental and analytical results that led to the hearings, and the technical soundness of the results codified by the hearings continued for decades. The Lewis Report is one such review, as is this report from Cal Tech. The latter report is very accessible and interesting to read as it summarizes how the Water Remaining matter caused the massive upheaval, and the fallout from the upheaval. The Interim Acceptance Criteria had, and in some cases continues to have, an exceptionally long Interim. The adverse effects of the IAC have yet to be completely eliminated, and the process of improving the situation has proven to be very long and expensive. I did not get deeply involved with the ECCS Hearings, but did provide requested information from time to time. One incident has remained with me for all these decades. At some point we were requested to provide copies of the original reports and papers for all the equations and correlations that were in the codes that were applied to safety analyses. At the time, we were generally relying on well-accepted, standard engineering models and correlations that had been reported in reports, papers, and textbooks for decades. Some had been developed in the early days of boiling two-phase flows and appeared only in the typical reports of those days. Dittus, F. W. and Boelter, L. M. K., Heat transfer in automobile radiators of the tubular type. University of California Publications in Engineering, 1930, No. 2, pp. 443-461. Note firstly the publication date, 1930. Next note the title of the report contains the words, . . . automobile radiators . . . tubular type. Much pure entropy noise was made over this ancient report (1930 !!) about heat transfer in automobile radiators (!!) being used 30+ years later for critical safety (!!) analyses of highest-tech nuclear power plants. There are very sound technical arguments, not reviewed here, that make these observations mote relative to when, where, how, and why the correlation is used in the analyses. Nevertheless, the opposition took these observations and ran with them to score many points adverse to nuclear electric power production. I recall that we arranged to get a Library Loan copy of the report and made copies, one of which was sent to Washington DC to become a part of the official record of the hearings. We did this for all the citation in the code manuals. Based of this situation, which obtains for almost all other engineering models and correlations used in the mathematical models for safety analyses, the AEC/USNRC, I’m not certain which, made it mandatory for the ranges of all parameters that appear in empirical correlations be reported in the computer code manuals. Additionally, these ranges were also programmed into the codes and a warning message was printed whenever any parameter was outside its range. Maybe the computer run was also stopped? In his technical note ‘‘Where did the Dittus and Boelter equation come from?’’, R.H.S. Winterton showed the likely creator of the modern version of the Dittus and Boelter equation was actually McAdams. The following note further investigates Winterton’s claim and finds conclusive evidence that the Dittus and Boelter equation did indeed originate with McAdams. The fortuitous combination of the ‘‘so-called’’ McAdams equation for smooth tube friction factor with the Reynolds analogy provides the leading coefficient of 0.023. McAdams actually attributes the usage of fluid bulk properties to his form of the equation to the work of Dittus and Boelter. Along the way, it was also found that what is commonly known as the McAdams equation for smooth tube friction factor is actually the work of E.C. Koo, his graduate student. So much for Original Sources. The Water Remaining issue first arose out of some early blowdown tests at Camp NRTS. I think these tests were conducted with early versions of the Semiscale test rig. (But there may have been tests that preceded these that used a simpler equipment?) As I recall, after the blowdown and ECCS injection ended someone was assigned the task to rush out to the test rig, unscrew a plug located at the bottom of the representation of the Reactor Pressure Vessel (RPV), let the (hot) water that remained in the vessel drain into a bucket, and then carry the bucket to a scale that weighed the bucket and water contents. Hi-tech to the max experimental procedure. It was discovered that much less water was remaining in the RPV than there should have been had the injected ECCS water remained in the system. The ECCS water was bypasing the core and leaving the system by way of the down-comer and then out the break. This was brand new news to everybody involved. Almost Earth-shaking news. At the least, the Earth around Idaho Falls and certain parts of Washington DC shook. When I say upheaval, I mean upheaval with a big U. The Finlayson Report from Cal Tech has a very good summary of how the ECCS bypass issue got to be a huge deal. There are several reports online that report the results of these early Semiscale experiments. The first one I ran across is for Semiscale Test 851, mit 122 figs. Semiscale Test 85l, reported in this document, was conducted to obtain experimental data for an outlet piping break relative to the effect of coolant injection on the availability of cooling fluid to a heater rod bundle and on primary system decompression. Test results from the Semiscale Project have been reported previously for decompression tests involving vessels with and without unheated internals, tests with the single-loop system configuration with and without unheated vessel internals[4-6]. single-loop tests with electrical heat, and a single loop test involving coolant injection for inlet piping breaks[8,9]. An right there in Table IV on page 19, the title of which is “SEQUENCE OF EVENTS AND WATER REMAINING”, we see some of the numbers that shook the world. I want to point out the sentences that that I have made bold. Firstly, the sentences make very explicitly clear that the test results do not apply to any reactor and safety-systems designs. Secondly, and this is right up my alley, it is explicitly stated that the primary purpose of the tests is to provide experimental data for Validation of the mathematical models and computer codes that are applied to safety analyses. In fact, Validation is just about the only application for which the data are useful. The importance of the concept of Validation of models cannot be over-stated. The nuclear power industry in the USA is accepted to be among the original source of the development and applications of Independent Verification and Validation of scientific and engineering software. The development really took off in the 1980s with the efforts of Pat Roache working within Professional Society Committees, primarily the ASME Fluids Engineering Division. Camp NRTS personnel joined the efforts by way of the Thermal Hydraulics Division (THD) of the ANS. A few joint ASME-ANS sessions (tracks) on the subjects were organized for the major meetings of the organizations. The References cited in the Test 851 report listed several more tests in the Semiscale series. I have added URL links to those that I found online. There are familiar names among the authors: Harry Heiselmann, Jim Zane, Don Curet, George Brockett, Jud Whitbeck, Claire Moserand Danny Olson. H. W. Heiselmann and J. O. Zane, Semiscale Blowdown and Emergency Core Cooling (ECC) Project, IN-1384 (July 1970). Water Reactor Safety Program Office, Water Reactor Safety Program Plan, WASH-1146 (February 1970). G. F. Brockett, H. D. Curet, H. W. Heiselmann, Experimenta1 Investigation of Reactor System Blowdown, IN-1348 (September 1970). D. J. Olson and J. F. Whitbeck, Semiscale Blowdown and Emergency Core Cooling (ECC) Project Test Report — Test 821, IN-ITR-203 (July 1970) (limited distribution). D. J. Olson and J. F. Whitbeck, Semiscale Blowdown and Emergency Core Cooling (ECC) Project Test Report — Tests 822 and 823, IN-1393 (October 1970). H. W. Heiselmann, D. J. Olson,. 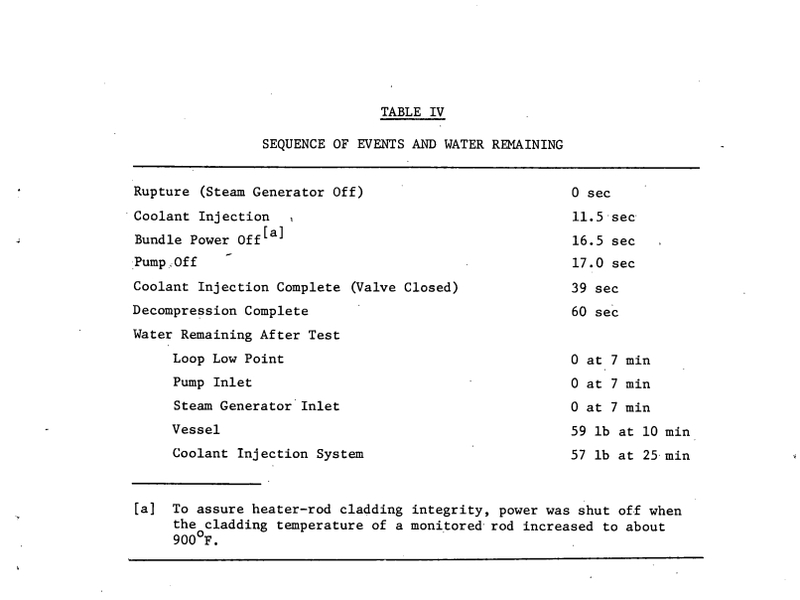 J. F. Whitbeck, Semiscale Blowdown and Emergency Core Cooling (ECC) Project Test Report — Tests 803 through 820, IN-1404 (October 1970). D. J. Olson, H. W. Heiselmann, C. M. Moser, Semiscale Blowdown and Emergency Core Cooling (ECC) Project Test Report — Tests 824 and 825, IN-1481 (June 1971). D. J. Olson, Semiscale Blowdown and Emergency Core Cooling (ECC) Project Test Report – Test 845 (ECC Injection), ANCR-1014 . (January 1972). D. J. Olson, Semiscale Blowdown and Emergency Core Cooling (ECC) Project Test Report – Tests 848, 849, and 850 (ECC Injection), ANCR-1036 (June 1972). Olde Camp NRTS Blog at WordPress.com.